How come all the Hollywood greats have those amazingly long, full and sweeping eyelashes? The answer is simple: ‘Push Up Lashes’. Celebrities and top models look so stunning because they get to hear about the latest developments just that little bit sooner than ordinary women from London, Leeds or Liverpool. But now, not only Jennifer Lopez, Beyoncé or Madonna can afford those Oscar-winning looks. What’s good enough for Beverly Hills is good enough for you. Push Up Lashes lengthen and enhance eyelashes – so that even without a red carpet to help, ladies everywhere can present an appearance à la Penelope Cruz. 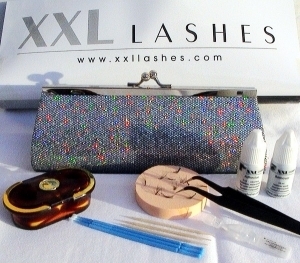 If you find professional eyelash extensions too expensive, you can use the Glamour Kit to get the same result. With this method, individual small clusters of sweeping eyelash hairs are applied to your own eyelashes in 30-60 minutes using a special waterproof adhesive. 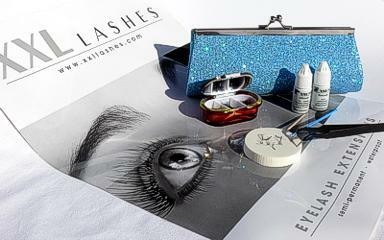 Just a little effort for great results – you’ll be able to flutter your eyelashes as effectively as Eva Mendez. 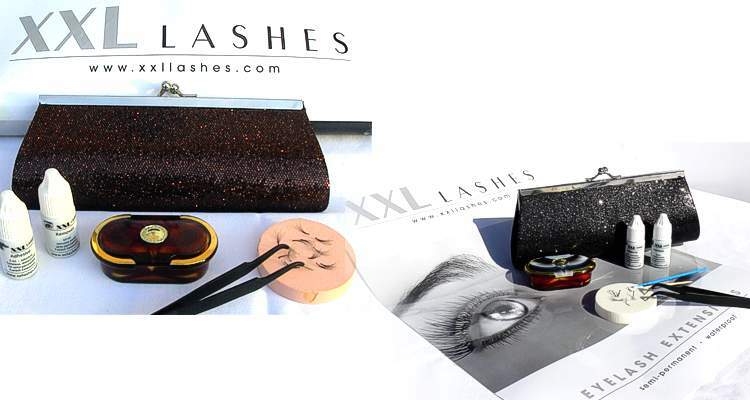 These Push-up Lashes, also called Flare Lashes, Individual Lashes or Cluster Lashes are a small bundle of single lashes, connected at the end in a little flare knot. bundle create a very natural look. Using the longest size, you can produce a truly glamorous appearance. When they are applied properly, the Push-up Lashes last about 2-4 weeks. The special adhesive makes them completely waterproof, it is even possible to shower, to swim or to sleep with them. 1 pair of XXL Lashes tweezers which you use to pick up and fit the Push-Up Lashes exactly. When they are sitting perfectly, you can used the curved end to press the lashes more firmly together, making them last longer. Small vinyl sponge – the perfect pad for you to spread out the lashes which you want to apply, so that you can easily pick them up with the tweezers. 6. 1 disposable Adhesive Ring. 7. 10 single-use micro-brushes - Ideal for applying a tiny amount of remover in case you wish to remove a single lash. 8. 10 palillos. These are fine absorbent wooden sticks. 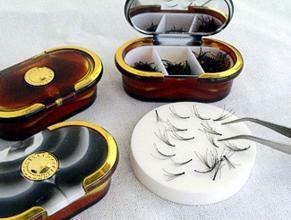 Use these to stroke the lashes which you have just applied into position. Work from the base to the tip to get exactly the right form. The stick absorbs superfluous adhesive, so there is no need to worry about 'mascara-like' residues spoiling the effect. 9. 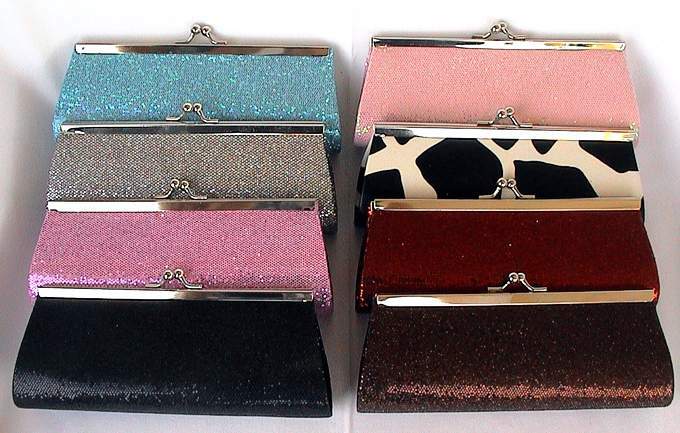 The kit fits into a glittering clutch bag which is so attractive it will draw plenty of attention itself. It is about 8 cm by 20 cm and it is available in a range of colours. If you state your preferred colour when you order, we will do our best to make sure that you get it. But please note that the range of colours shown cannot be kept in stock at all times. 10. The kit comes with a set of instructions which explains exactly how to proceed in order give your eyes this wonderful enhancement. When you buy the complete kit you save more than 20 EUR compared with the price of all the individual items added together. bewitch your world with beautiful eyes and a dazzling look.